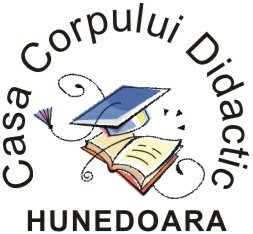 Casa Corpului Didactic Hunedoara (C.C.D. - Teachers Training Centre) is a linked educational institution, to the Ministry of National Education through the Direcția Generală Management și Rețea Școlară (The General Directorate Management and School Network), and to the Hunedoara Educational County Superintendence on a local plan. C.C.D is an autonomous institution with juridical personality. The C.C.D. is apolitical and non-discriminatory. It is designed as: resources, innovation and expertise centre: research and development centre; management centre for numerous activitities. C.C.D. Hunedoara represents a resource-centre for the educational units (and not only for them) in the area. Such requests should be sent in writing at the secretariate of C.C.D. and they should contain the educational unit, the date and time of the action, the place, the contact persons, and the list of the necessary devices. The equipment of the Casa Corpului Didactic Hunedoara also includes the following categories: educational software, books and magazines. Programs are designed and supported by staff with expertise in the area of training adults - trainers, instructors, university teachers, who are responsible for projects and training programs accredited at national level, specialists, other providers of training, educational partners from countries such as Finland, Austria, Germany, Turkey.